Adds an additional circle to the fleet pursuit indicator, which shows you where the fleet will be after two regular jumps. Install with Slipstream Mod Manager. Best loaded after any other mods you might be using. Adds two discrete rings to the fleet pursuit indicator, showing you where the fleet will be after two and three regular jumps. Install with Slipstream Mod Manager. Best loaded after any other mods you might be using. Adds five very subliminal rings to the fleet pursuit indicator, showing you where the fleet will be after up to six regular jumps. Install with Slipstream Mod Manager. Best loaded after any other mods you might be using. Adds 25 very subliminal rings to the fleet pursuit indicator, showing you where the fleet will be after pretty much any amount of regular jumps (unless you are using mods that heavily delay the fleet.) Install with Slipstream Mod Manager. Best loaded after any other mods you might be using. Adds 25 very subliminal rings to the fleet pursuit indicator, showing you where the fleet will be after pretty much any amount of regular jumps unless you are using mods that heavily delay the fleet. Also features numbering added by 5thHorseman. Install with Slipstream Mod Manager. Best loaded after any other mods you might be using. 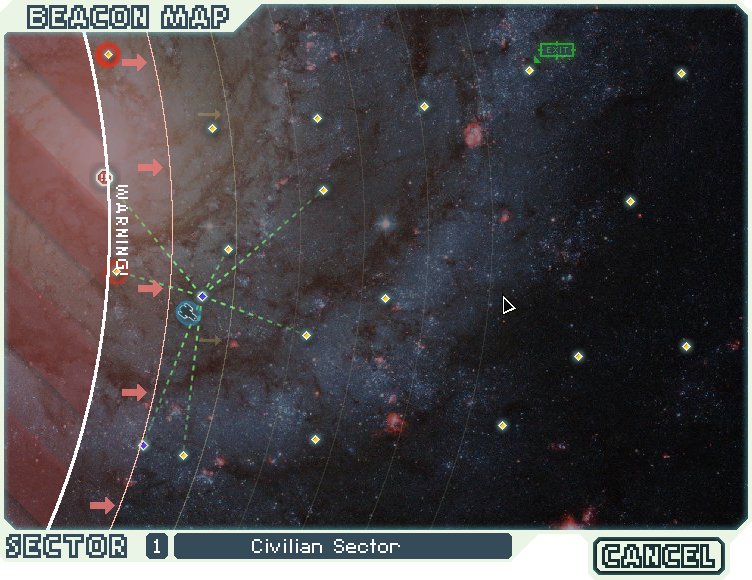 Some extremely simple mods that add more levels to the Rebel pursuit indicator on the sector map screen, allowing you to gauge easier how far the fleet will advance after a certain amount of jumps and if it will overtake a certain beacon. You don't have to rely on measuring tape or your thumb anymore. I did a bit of testing and I think its pixel-accurate now (fun fact: the fleet advances by exactly 64 pixel per regular jump.) But let me know if you think the graphic is off somehow. The additional levels of the indicator won't adjust to nebula jumps. Could be fixed by adding 0.5 marks between the additional indicators, but these would always be shown, so it would be just as odd IMO. 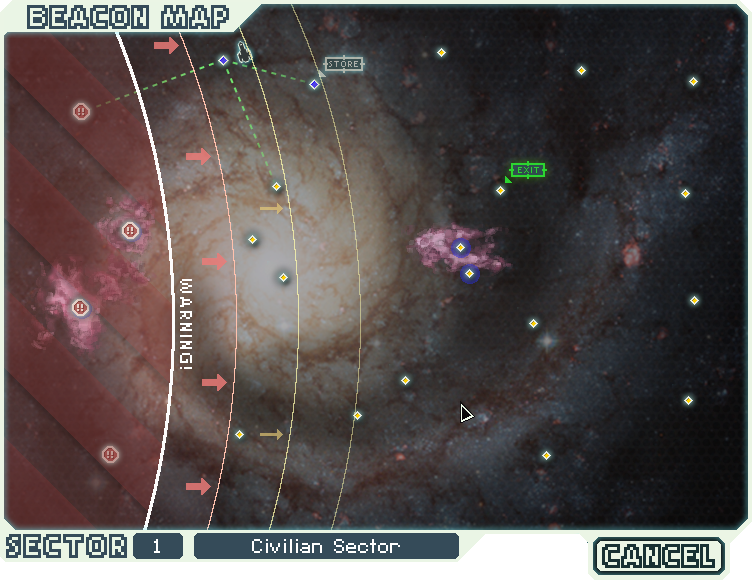 There would also have to be additional markers for nebula-sector nebula, creating even more visual clutter. Enjoying you free game content? Want to show you appreciation and support my work? Last edited by Sleeper Service on Sun Oct 19, 2014 4:50 pm, edited 8 times in total. Ah, this still works despite the size of the original graphics being shrunk compared to pre-AE? That's pretty neat. The main problem I keep having when I use this though is trying to tell the difference between the guesstimation lines and the actual Rebel line, it messes with me a lot. Perhaps the extended lines should just be made a little bit more transparent??? Maybe there could also be a version with only 1 extra jump shown? Either way, this is a great idea and I can't believe I haven't thought of this before. Russian Rockman wrote: Perhaps the extended lines should just be made a little bit more transparent??? I've tried this in the past based on the pre-AE game where the graphics file had leeway off to the right of the image so that I knew it was safe to try it. What I'm personally thinking though is a guide that shows the progression of the fleet for just a single extra jump, but tuned for the three outcomes of empty space, nebula, and nebula-in-a-nebula-sector. "Icicle, icicle, where are you going? I have a hiding place, when spring marches in..."
Well that was rather encouraging. I added some more variants and globally made the additional indicators more transparent, in an attempt to make them appear a little less distracting. Good job. I'm split between x5 and x24 version, but I think I'll stick with x5 one - during so many jumps there is high probability of delaying/slowing/speeding down fleet, anyway. Would be possible to use effectively without making every next line a little more transparent, so thanks a lot! Now it looks really natural. Thanks for this addon, before one patch we couldn't see what beacons a beacon can access, this though didn't had fix and when I was motivated I was using paint to see how many beacons I could reach without the rebels being on the final beacon, and when I wasn't I simply could loose to rebels or not farm enough because of that. As expected though, it's quite a bit a cheat that when you reach a new sector or start a new game you can see them already, before you see the first circle already. Maybe they are always as far each new sector but not the "center of the curve" has not always the same vertical position, it doesn't matter much though.